This step drill is designed to drill holes and recesses to snugly fit the specialized screws and handle fasteners that are used in the knife and gun making industry. It will also work for many other applications where you are recessing appropriately sized screws. These are made from HSS high quality bits. Each one is turned to our rigid specifications and are very precise. They feature a brad point tip to center the entry point on your material (very important to accurate hole placement). We do not recommend using this model on steel or metal, as they are designed for handle materials and composites, such as woods, bones, carbon fiber, phenolic-type resin based materials and much more. 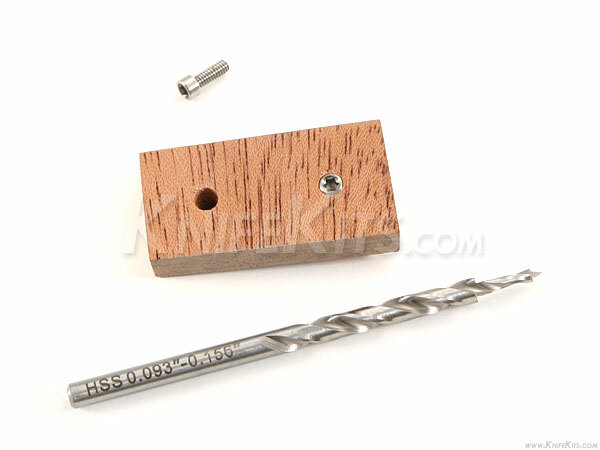 They also work well for many other specialty precision uses, such as modeling, wood working and crafts. This model is designed for setting 2-56 socket head screws (shown in image), or any fastener featuring a .093" thread diameter and .156" head diameter or less.